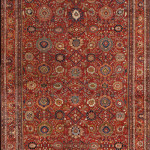 Khaledi Oriental Rugs was founded by our grandfather in 1910. His passion and driven motivation earned him to became a legend in the antique and modern rug dealer in many areas including, but not limited to Iran, Europe and throughout the Middle East region. And we presently are still working our very hardest to maintain the title and best meet the requirements and satisfaction of all of our customers.